Then, what can a beginner do? It’s simple: Just grab the Yonex Nanoray 10 and start playing. It’s an amazing option for newcomers, and moreover, it’s very affordable. Want to know more about it? Then come with me so you can discover all the things this excellent racquet can do for you. Perfect for beginners. It’s very affordable and easy to use. Very light-weight. It won’t tire your wrists. Nice sweet spot. It’s easy to land the shuttle on the sweet spot repeatedly. If you are looking on a very tight budget and want to get started as soon as possible, then the Yonex Nanoray 10 is a perfect pick for you. It’s affordable, well-rounded and very easy to use. Moreover, it comes pre-strung so you can start playing with it right off the bat. If you want to review more aspects of this racquet – like the construction and tech used – then just keep reading. Despite being one of the lowest price badminton rackets, it comes equipped with interesting pieces of technology. The appearance of this racket won’t make you say “wow”, but it’s still pretty good. It looks fairly decent. Even though it doesn’t come equipped with tons of technology like the Nanospeed 9900, Nanoray Z Speed or any other top-of-the-line racket, it still contains excellent features for a high-quality experience. It’s a good idea to dedicate a complete section to this technology, because the whole racket is based on it. It’s inserted in the frame and shaft of the racket. This insertion grants it several benefits we will be discussing in this section. It gives you a pretty good repulsion power because of it. It allows the frame and shaft to resist the impact better and bring you a more powerful come-back. This technology also makes it more powerful. Some head-light racquets have got a bad name and are referred as “weak” in comparison to heavy-head rackets like the Voltric Z Force II, but thanks to this tech you will get a pretty decent hitting. Nice handling. Thanks to this excellent construction you will have an easier time handling your racket, and this is pretty good for beginners. This, paired with the Control Support Cap, will bring you an excellent handling, nice maneuverability and solid gripping. Thanks to the isometric design of the frame and its nice sweet spot it will be easier for you to throw more successful shots. You probably know that it’s one of the biggest obstacles for beginners: Hitting the sweet spot. But the Nanoray 10 makes it easy for you. And finally, the built-in T-joint will grant you better control on the shuttle when it is on the string bed, which will give you more precision. This along with the isometric frame and Nanomesh + Carbon Nanotube technology will give you plenty of power and excellent accuracy. As you can see it’s a pretty good budget-friendly racket, but now it’s time to review its performance in the game. Serving with this racquet is not an issue. You get accuracy and power, which is exactly what you need for successful serves. Thanks to the power and fast swings of this racquet it’s easy to throw clears and make them go far and packed with some serious power. 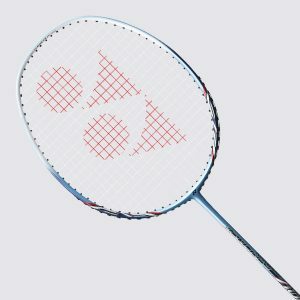 Smashes are not the best, but they are decent, especially if you take into account that it’s a light-head racket. If you want to improve this, then you can add some lead tape to the head, just take into account that you will be sacrificing control and balance, which can be a major problem for beginners. Drives are nice with this racquet. Thanks to the Nanomesh + Carbon Nanotube you will sharp and accurate drives. It’s especially good when it comes to defense, not as good as the Nanoray Z Speed, but still pretty good for the price. Lifts are also easy thanks to the fast reactions and light weight of this racquet. If you want to practice your defensive game, then you should give it a try. For such a low price it has an impressing performance which is perfect for beginners.